Connects Mail.app with ToDo X. Developer website: Omicron Software Systems, Inc.
Is there a better alternative to Mail to ToDo X? Is Mail to ToDo X really the best app in Personal Info Managers category? Will Mail to ToDo X work good on macOS 10.13.4? 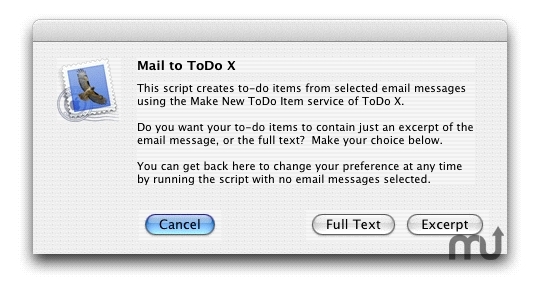 Mail to ToDo X is an AppleScript to connect Apple's Mail with the shareware to-do list application ToDo X. It provides a convenient way to create to-do items from selected email messages. The to-do item's name will be the message subject, and the notes will contain either an excerpt of the message or (if you prefer) its full text. At the end of the notes you'll find a clickable link that will open the message in Mail. Email message links created by Mail to ToDo X will be message:id URLs in Leopard and Snow Leopard, or file:path links in Tiger. Mac OS X 10.4 or later, ToDo X. Mail to ToDo X needs a review. Be the first to review this app and get the discussion started! Mail to ToDo X needs a rating. Be the first to rate this app and get the discussion started!